I have more than 25 years’ experience of working in the voluntary sector as a Magistrate, School Governor, College Governor, and Chair of NHS Oldham. Until recently I was Chairman of Oldham NHS Primary Care Trust for the previous decade, leading it to become the Best Health Trust in the country with the major development of new centres across Oldham providing good care to residents as well as recruiting additional GPs and Nurses. 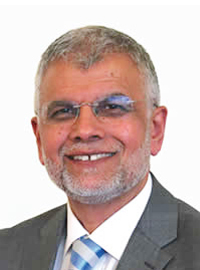 I am a former Mayor of Oldham and have vast experience of working with all communities. I have also previously served as a Councillor and been Cabinet Member for Finance and the Environment as well as serving on important committees like Housing, Planning, Economic Development. I am Chair of Governors at Greenhill School, which has been transformed from a failing school to being one of the top ten schools in the country. I am also a Governor at Waterhead Academy and played a leading role in bringing Breeze Hill School and Counthill School together and improving standards. Currently I am also a Governor at Oldham College and have served as a governor at several other local schools. As a Magistrate I now have more than a quarter of a century of experience in law and order issues. I am also an accountant and run my own practice in Manchester. I am married with four grown up children and two grandchildren. In 2008, I was honoured to be awarded the OBE (Order of British Empire) for my services to the community.